Bethesda Softworks is no stranger to presenting unique game experiences, including the likes of Dishonored (which mixed medieval themes with high-tech tweaks), The Elder Scrolls V: Skyrim (a game that expanded the world dynamically with dragons and fantastic spells) and even Wolfenstein: The New Order (bringing back the classic feeling of Wolfenstein within a harrowing new world). So it should be no surprise that its forthcoming free-to-play effort Battlecry looks to follow suit. The game, which was on full display this past weekend at the QuakeCon event in Dallas, allowed players to try out a trio of classes (out of the five available) to take on one another in 32-player online combat. Though only one map was shown over the course of the game, the experience speaks volumes, as you go at in in crazed up-close combat, or, if you prefer, picking off foes from afar with a Tech Archer. If you're looking for guns in Battlecry, you won't find them. At the turn of the 20th century, a gigantic war has managed to wipe gunpowder off the face of the map, leading to an uneasy peace between countries. However, it doesn't last long, as the sides are soon heated up again, and begin to charge towards Warzones in the hopes of dominating once more. Since you can't rely on assault rifles to get the job done, you'll need to use more conventional weapons within Battlecry. Each warrior carries a particular tool that can do a great deal of damage to opponents, along with special abilities that are classified for each one. The game will feature five classes to start (Brawler, Tech Archer, Enforcer, Duelist and Gadgeteer), and three of them were playable with our demo on the show floor. Each character brought something great to the table, which is nice for a multiplayer game. Usually, a player is best suited for a particular skill, such as a sniper or a well-armed soldier. Here, you can easily pick up any of the three. One particular favorite is the Enforcer. This is probably the most balanced player of the bunch, as you carry around a giant axe-like blade and charge at enemies with a few dangerous swipes. With this class, you can hack away with foes with a combo slice, or swing it around like a giant sledgehammer, hitting everything in your path for a few seconds. The "swoop" technique is also useful, as you can charge it with a big axe swing. Time it just right and you can take someone down in an absolute hurry. The second class, the Duelist, isn't as strong as the Enforcer, but is quite nimble in combat. The Duelist moves much faster, and can get around easier carrying a pair of blades. They're good for up-close combat, and you can charge their techniques for a durable multi-hit attack as well. They're also a good stealth sort of character, as their speed and durability makes it easier to sneak up on someone and take them down. Again, though, if they're a stronger character such as the Enforcer, it may not be so much of a fair fight. Finally, the Tech Archer is the "sniper" class of sorts. You can use them to shoot enemies from afar, which is useful when combined with the efforts of the ground soldiers. They're also not bad in up-close combat, as they can use a pair of daggers to fend off certain enemies. However, they're the weakest of the bunch when it comes to that. They're best to keep their distance. In addition to offensive moves, characters can move out of the way with slick dodge moves, in case they want to try and get behind someone and attack them. These are particularly useful when it comes to staying in one piece, as you can regenerate lost health provided you aren't hit immediately again. Oh, and if you end up facing against a group on your own, you've probably had it. Run away and regroup with the others, unless you like committing suicide. One nice touch with the multiplayer is that, even if players lose a match, they can earn bonus kudos for their character by saluting the winners. Although we didn't see this much during our team deathmatch sessions (some players just want to win), it's pretty cool to see. 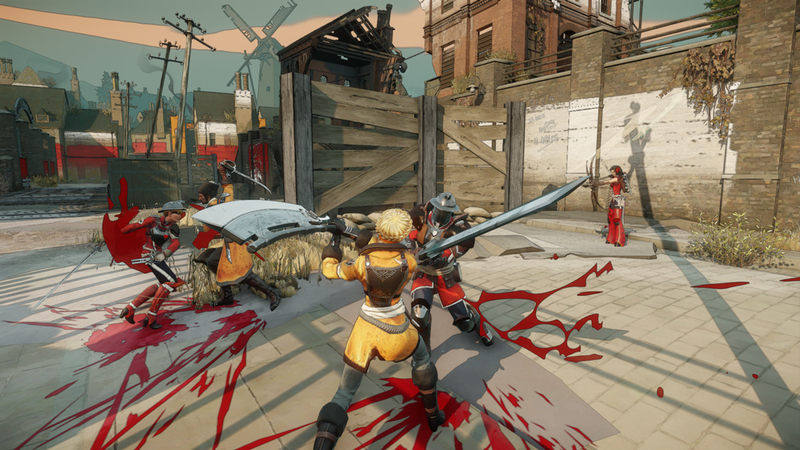 Battlecry is still a ways off from release, as it isn't slated to arrive on PC until sometime in 2015. However, Bethesda's doing some very good work on it thus far, and it seems to run at a rather brisk pace, even in this stage of development. We'll see how it progresses over the next few months. Who needs a gun? Not these guys. Robert Workman posted a new article, Battlecry impressions: unto the breach. This looks pretty cool. Kudos to Bethesda for trying something new. Also, I have to say I welcome this new wave of FTP multiplayer games. I've always been more of a single-player guy, but now I can try all sorts of online stuff and if I bounce off it or the player base dries up it's no big deal because it's free.